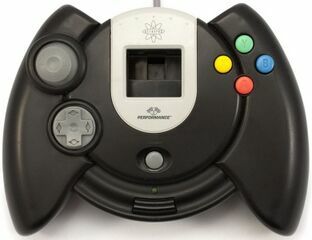 The AstroPad is a third-party controller for the Sega Dreamcast, manufcatured by Performance (and distributed in some regions by InterAct). It is a fairly average third-party controller, adding no new features aside from a turbo (or "auto fire") button in the centre. However, it has seen more colour variations than any other third-party controller for the system. Initially the controller was distributed in red, green, blue and black varieties. Later "transparent", transparent-red, transparent-green and transparent-blue were added.